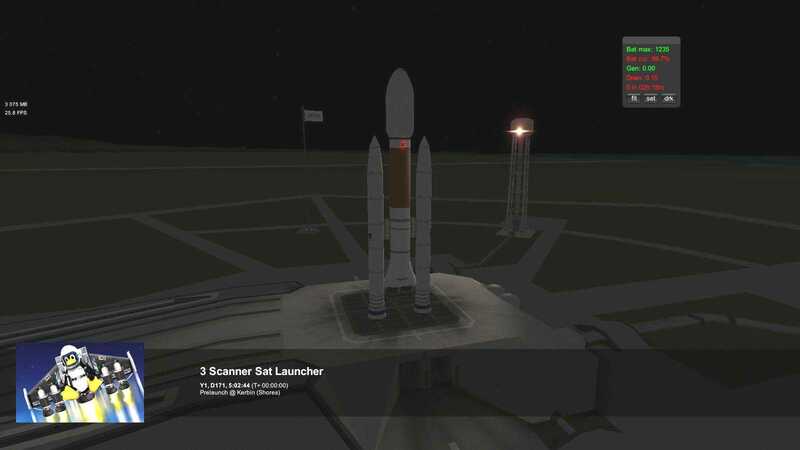 A mod rocket called 3 Scanner Sat Launcher. Built with 61 of the finest parts, its root part is NP.sas.25m. Launches 3 satellites, each with a different scanner. Used to put satellites into polar orbit around Kerbal, Minmus and Mun. Satellites are built around the 2 Oscar tanks and Spider engine, giving them enough Dv to get into the correct orbit. If you are running ScanSat, you will need to add an antenna to the main booster if you want to deorbit it. Extra batteries on the main booster wouldn’t hurt either, and a couple of solar panels as well.